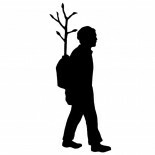 Drawing on the work of Joseph Beuys and other socially engaged and ecological art practitioners, Dundee Urban Orchard is a contemporary art and performance practice working in collaboration with the city of Dundee and its citizens. Apple Usherette in conversation with visitors at Dundee Flower and Food Festival – gauging interest and support for the project, 2012. Trusting in the power of the creative imagination and challenged to address the triple crisis of climate change, peak oil and food scarcity, we plant orchards in the city and orchard thinking in the mind. Dundee Urban Orchard working with the Dundee Commons Festival on an all day event exploring sustainable urban food systems, 2016. Vandana Shiva’s definition of biodiversity and her call for creative action speaks volumes for our work. Biodiversity means the diversity of life – the rich diversity of life forms on our beautiful planet. Biodiversity is the very fabric of life – it provides the conditions for life’s emergence and maintenance, and the many different ways in which that life is expressed. Biological diversity and cultural diversity are intimately related and interdependent. Biodiversity is in fact the embodiment of centuries of cultural evolution, because humans have co-evolved with other species in the diverse ecosystems of the world. Biodiversity in its turn has shaped the world’s diverse cultures. The erosion of biodiversity and the erosion of cultural diversity are related. Both have been threatened by the globalization of an industrial culture based on reductionist knowledge, mechanistic technologies and the commodification of resources. Responding to this challenge, DUO work with individuals, community groups and cultural organisations to reimagine Dundee as an Orchard City. We ask, what would Dundee look like, feel like, sound like, taste like, and smell like if the city was an Orchard City? And what could we learn from the planting, caring and harvesting of orchards that our current models of urban development fail to deliver? Members of the Orchard City network who gathered to plant an orchard in Slessor Gardens, 2017.